This page lists additional endodontic-related Web sites you may wish to visit. Please note that by linking to these sites, the AAE does not endorse the policies or practices of, or opinions expressed on these sites. This information is intended to assist users in locating additional online resources. Includes links to other web resources on dental materials. An extensive site featuring both consumer and professional resources. Includes an online newsletter and information on TMJ (temporomandibular joint disorders). Site includes patient and professional information. Includes a section on Persons With Special Health Care Needs, and online policies and guidelines. Comprehensive site that provides information for both the public and professionals. Describes techniques and materials, and includes case studies. Includes links to state boards, which have information on specific rules governing record retention requirements. 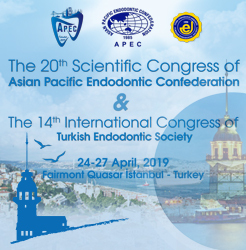 Includes information for patients and professionals, access to guidelines and position statements, a link to the American Board of Endodontics, the certifying agency for the specialty of endodontics, and member access to the Journal of Endodontics. Contains both consumer and professional resources. Includes both professional and public information. Association of Professionals in Infection Control and Epidemiology Inc.
Includes position papers and information on specific infectious diseases and regulatory and legislative action. of the U.S. Food and Drug Administration. Contains information on medical waste disposal. A not-for-profit coalition of concerned health care professionals committed to assuring access to high-quality oral health care services for adults, adolescents, and children living with HIV disease. Includes many open-access online materials. A "non-profit trade association representing" dental HMOs, dental PPOs, discount dental plans, and dental indemnity products. Website (http://www.nidcr.nih.gov) provides accurate up-to-date information about oral health clinical trials, patient resources, research advances, and funding and training opportunities for researchers and health professionals. Includes online continuing education materials. Includes information on Bloodborne Pathogens and Needlestick Prevention. Includes links to related support organizations. A subsidiary of DENTSPLY International. Includes a little history on the endodontic obturator. Provides online product evaluations of dental equipment and materials.